For the last year or so micellar waters are the "thing" to get the perfect skin, you always wanted. Some of you may wonder if just one product can deliver all of this? The answer is no. In fact, it can do quite the opposite by using it the way it is promoted. Let me explain why. Allegedly, micellar water is the beauty secret of all French women. They just pour a little bit on a cotton pad, swipe it over the face, and that's it for their skincare routine. No additional steps are necessary, no rinsing of the face; some even profess you need no extra moisturiser due to the "magic formula" of these micellar waters. According to the claims, they solely consist of micelles suspended in soft water. These act like little magnets pulling the dirt out off the skin. Even better, the reported lack of alcohol or soap in these solutions should result in a hydrated skin. Yes, micellar water has its origins in France, where it was invented as an addition to the harsh water, but that's about it when it comes to the truth. 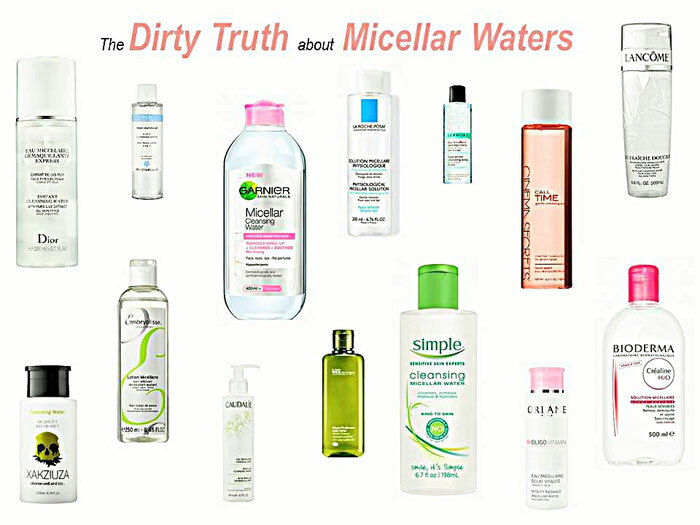 First Misconception: Micellar Waters don't contain soap or other abrasive chemicals. Wrong, when you break it down to basics, micellar water is nothing more than soapy water. To explain why I have to go a little bit deeper into the whole face cleansing process. To remove oil or makeup from your face, you need a surfactant to break down the interface between oil and water. Oil and water can't stand each other that's why oil always floats on top of the water. 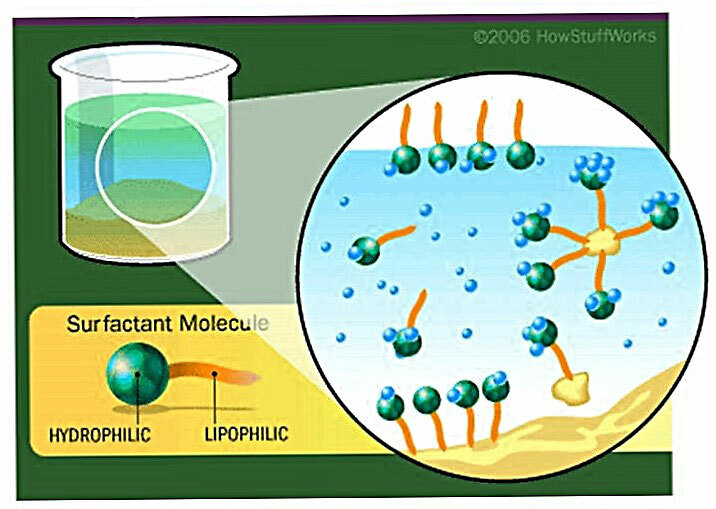 Here is where the surfactants come into play. The term derives from the words surface active agent. They consist of a hydrophilic head (loves water) and a lipophilic tail (loves oil). This structure allows them to break down the interface between oil and water as well as holding the oils/dirt/makeup in suspension allowing their removal. Because of this dirt-removing feature, you find surfactant in (almost) every cleansing product. What do surfactants have to do with the micellar water? 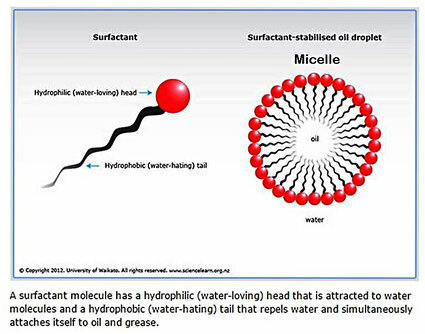 Well, when surfactants interconnect with water, they huddle together into little spheres called micelles, the water-loving heads point to the outside while the oil-loving tails point inwards. Hence micelles are simply little soapy batches swimming in water. Why don't micellar waters need additional water? The reason is the cotton ball. Like water, it is hydrophilic (water-loving). 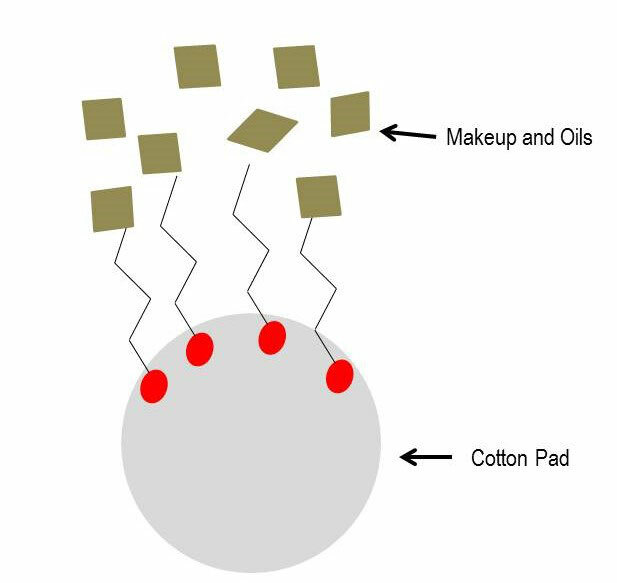 So, when you pour some micellar water onto a cotton pad, the outward pointing water-loving surfactant heads are drawn to the cotton pad, while the oil loving tails point to the outside grabbing the oil and makeup while you wipe the pad over your face. So far we can retain: Micellar water is a two in one cleansing product, containing soap like batches swimming in water. These micelles obviate the need for added water to remove excess oil and makeup from the face. The only additional thing needed is a cotton pad. Second misconception: You don't have to rinse off your face after using micellar water. To put it bluntly, I can't recommend it. Like all the other facial cleanser micellar waters have one purpose to clean your face. So, if you don't rinse it off, you leave these cleansing action on your skin for the whole day, night or even worse 24/7. For sure, there are different kinds of surfactants, some are milder than others, but still, I wouldn't leave the micellar water on the face without ever removing it. You risk that it breaks down your protective skin barrier which shields you from changing weather conditions, air pollution as well as free radicals. Such a damaged skin barrier can lead to dryness or even premature signs of skin ageing. Moreover,these cleansers are for sure no replacement for you moisturiser and your sunscreen. Although the claim is, that these waters don't contain any additional alcohol, fragrance or other abrasive chemicals, many of them do. Just check the ingredients list. They can, therefore, further increase the risk of a damaged skin barrier, when resting on the skin nonstop. Micellar waters don't contain a "magic formula". They are facial cleanser with the same active ingredients like every other one, too. They certainly don't replace all your other skin care items and shouldn't be left on the skin all day long. Danke für Ihren Beitrag. Ich habe im Frühjahr dieses Abschminkwasser benutzt. Ich habe nach kurzer Zeit, keine 3 Wochen später, totale Hautprobleme bekommen. Obwohl ich danach immer mein Gesicht abgewaschen habe. Meine Haut hat bis Oktober gebraucht um sich zu regenerieren. Die war sehr trocken, Rötungen waren da und es war immer ein auf und ab.Ich sah zeitweise ganz schlimm aus.